Cabo San Lucas is home to excellent resort weather for most of the year, with hot temperatures, clear skies and minimal humidity. Hardly any rain ever falls on the southern Baja Peninsula - the region has a median of ten inches of rain annually. Residents of Los Cabos enjoy 300 days of sunshine every year. 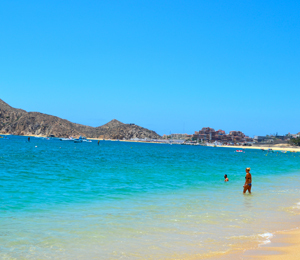 During the wintertime, Cabo's median temperature remains around seventy-six degrees Fahrenheit. This is the perfect time of year to cruise into the Sea of Cortez to watch the magnificent Gray Whales. Like people, these humongous marine mammals journey to Los Cabos to escape from the cold wintry temperatures. Pods of these gigantic cetaceans can be seen from January through the end of March. Gray Whales venture to the Sea of Cortez in order to mate, give birth, and nurse their young. The perfect weather of spring, with temps hovering in the eighties (Fahrenheit), attracts throngs of North American university students every March and April for the annual ritual of spring break. Because the summertime high temps climb to around ninety-six degrees (Fahrenheit), August and September are somewhat sluggish for tourism in Cabo San Lucas. But, the elevation in water temperature (reaching eighty-five degrees) in the Sea of Cortez draws plenty of feeder fish. Large pelagic species like Wahoo, Striped Marlin, Dorado, and Yellowfin Tuna flock to the area from the Pacific to hunt these smaller fish. Although the waters are more turbulent during summer and autumn, dedicated sportsmen cannot resist the opportunity to hook a prized Marlin. Surfers also travel to the beaches of Los Cabos this time of year; the occasional hurricane swells, referred to as chubascos by Cabo residents, create excellent conditions on the East Cape. The autumn offers idyllic beach-going weather for vacationers to Cabo, with day-time temperatures reaching the middle eighties Fahrenheit. Storms do tend to intensify during the fall, but Los Cabos rarely feels the brunt of hurricanes or tropical storms. Surfers are stoked when the south swells roll into the beach on the East Cape and Costa Azul. The best local beaches on the shores of the Pacific enjoy smooth western swells during autumn.